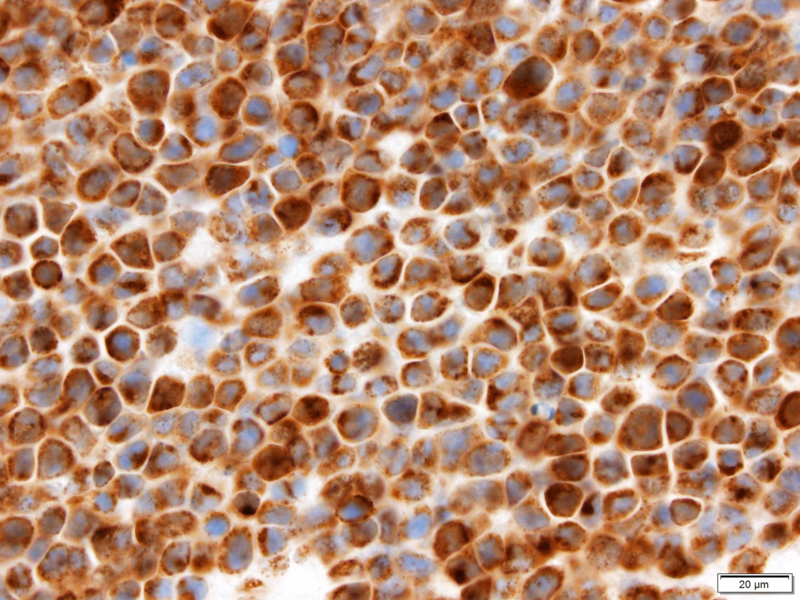 The authors of the study show that primary effusion lymphoma cells are addicted to high levels of the anti-apoptotic protein MCL1 (brown stain), which offers an attractive therapeutic target for this disease. Northwestern Medicine scientists have identified hundreds of key genes in primary effusion lymphoma and highlighted two genes that, when inhibited, may slow progression of the cancer, according to a study published in Nature Communications. This large, unbiased genetic screen paints a new picture of how the disease works, according to Eva Gottwein, PhD, assistant professor of Microbiology-Immunology and senior author of the study. “We’ve identified some very critical genes that had not yet been implicated in this cancer,” said Gottwein, who is a member of the Robert H. Lurie Comprehensive Cancer Center of Northwestern University. 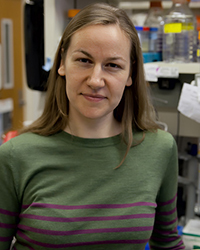 Eva Gottwein, PhD, assistant professor of Microbiology-Immunology, member of the Robert H. Lurie Comprehensive Cancer Center and senior author of the study published in Nature Communications. Primary effusion lymphoma (PEL) is a rare and aggressive cancer caused by the Kaposi’s sarcoma-associated herpesvirus. According to Gottwein, little is known about the oncogenesis of this cancer, making it difficult to identify mechanisms of disease and eventually treatments. Previous studies of this cancer’s disease mechanisms were often targeted; selecting a candidate gene to study and characterizing how it was involved in the disease. In contrast, the current study was a large-scale unbiased genetic screen in eight unique patient-derived PEL cell lines, searching for any genes that are important to PEL. Using CRISPR-Cas9 gene editing, the scientists knocked out genes in PEL cells one at a time, creating thousands of variants each with one gene turned off. If a cell didn’t survive, that knocked-out gene was flagged as important. In all, the scientists had identified about 860 genes that were critical to oncogenesis and progression. In particular, strong dependencies on the proteins expressed by genes Cyclin D2 and MCL1 are a boon for future therapies, as drugs that inhibit those proteins already exist, according to Gottwein. Cyclin D2 is a gene involved in the cell cycle, and its inhibitor — called palbociclib — is already FDA-approved in breast cancer. Mark Manzano, PhD, a postdoctoral fellow in the Gottwein laboratory and the first author of the study published in Nature Communications. 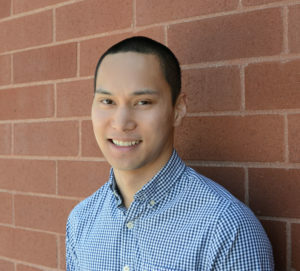 “It’s being used in the clinic and specifically targets cyclin-dependent kinases, which are important for the cells to proliferate,” said Mark Manzano, PhD, a postdoctoral fellow in the Gottwein laboratory and the first author of the study. MCL1’s current patient-approved inhibitors, however, are less specific, targeting not just MCL1 but a variety of genes in the same family. But a newly discovered compound called S63845 could solve that problem by binding only to MCL1, according to Manzano. “This is a very attractive therapeutic agent, because the last thing we want to do is use drugs that kill other normal cells in the body,” Manzano said. Next, the investigators plan to test the inhibitors in animal models, working with Northwestern’s Center for Developmental Therapeutics to test the efficacy of the candidate drugs. In addition, they aim to learn more about the cancer itself, informing future therapy. Other Northwestern authors include Ajinkya Patil, research technician in the Gottwein laboratory and Amir Behdad, MD, assistant professor of Pathology and a member of the Robert H. Lurie Comprehensive Cancer Center. This study was supported by National Cancer Institute grants R21 CA210904 and R01 CA180813, by Searle and Zell Scholar Awards from the Robert H. Lurie Comprehensive Cancer Center and the Chicago Biomedical Consortium Postdoctoral Award PDR-061.